In an article in International Business Times (August 5, 2015), Aditya Tejas quoted researcher Malin Pinsky in his recently published paper that claims smaller, faster-growing fish like sardines and anchovies are more vulnerable to population collapses than larger fish. “Climate variations or natural boom-and-bust cycles contribute to population fluctuation in small fast-growing fish, ” Pinsky said, “but when they are not overfished, our data showed that their populations didn’t have any more tendency to collapse than other fish. ” He called these findings counterintuitive because the opposite dynamic holds true on land: “Mice thrive while lions, tigers and elephants are endangered, ” he said. While it’s common these days to blame the ocean’s woes on overfishing, the truth is Pinsky’s conclusions don’t paint a complete picture. Fortunately, we do have an accurate picture and it’s definitely better than the proverbial thousand words. The picture is a graph (adapted from Baumgartner et al in CalCOFI Reports 1992, attached) that shows sardine booms and busts for the past 1,400 years. The data were extracted from an anaerobic trench in the Santa Barbara Channel which correlated sardine and anchovy recoveries and collapses with oceanic cycles. It’s important to note that most of sardine collapses in this timeframe occurred when there was virtually no commercial fishing. 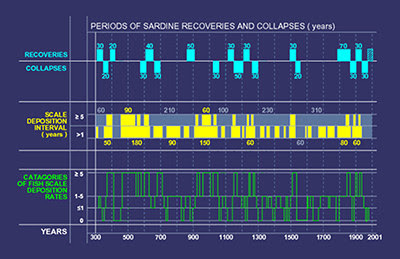 The best science now attributes great fluctuations and collapses experienced by sardines to be part of a natural cycle. “Pinsky has never been a terrestrial biologist or naturalist or he would have known that small rodents have boom and bust cycles brought about by combinations of environmental conditions and the mice’s early maturity and high fecundity rates, ” says Dr. Richard Parrish, an expert in population dynamics now retired from the National Marine Fisheries Service, . Again, this simply is not true. Since the fishery reopened in 1987, Pacific sardines have been perhaps the best-managed fishery in the world – the poster fish for effective ecosystem-based management. The current harvest control rule, updated to be even more precautionary in 2014, sets a strict harvest guideline that considers ocean conditions and automatically reduces the catch limit as the biomass declines. If the temperature is cold – which scientists believe hampers sardine recruitment – the harvest is reduced. And if the population size declines, both the harvest rate and the allowable catch will automatically decrease, and directed fishing will be stopped entirely when biomass declines below 150,000 mt. In fact, the current sardine harvest rule is actually more precautionary than the original rule it replaced. It does this by producing an average long-term population size at 75 percent of the unfished size, leaving even more fish in the water, vs. 67 percent in the original rule. The original harvest rule reduced the minimum harvest rate to 5 percent during cold periods. The present has a minimum rate of 0 percent during cold periods. Compare this to the 1940s and ’50s when the fishery harvest averaged 43 percent or more of the standing sardine stock with little regulatory oversight and no limit on the annual catch. This, coupled with unfavorable ocean conditions, culminated in the historic sardine fishery collapse that devastated Monterey’s Cannery Row. But that was nearly 70 years ago, not “recent decades. ” Our current fishery harvest is less than a quarter of the rate observed during that historical sardine collapse. As a scientist, Pinsky should be aware of the complex, proactive management efforts that have been in place for decades to prevent overfishing in California and the west coast. He should also be aware of the data from Baumgartner that contradicts his faulty conclusions. D. B. Pleschner is executive director of the California Wetfish Producers Association, a nonprofit dedicated to research and to promote sustainable Wetfish resources.